I love this cheese. I just figured out it’s a mix between gorgonzola and camembert. I’m a little slow! It’s at Trader Joes and Costco. Creamy and mild, yummy with salami and pita bread and sour pickles on the side…. Yummo! 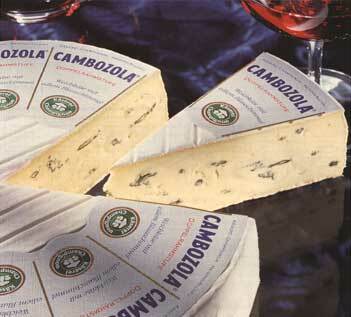 I also love the cambezola, and I'm a big fan of really, really aged gouda. If it's a strong cheese, then I probably love it. I am a product of growing up in one dairy state (MN) and then living in another (WI) for most of a decade! Smoked Gouda, Smoked Baby Swiss, Smoked Cheddar, anything that's been smoked. I'm more of a fan of firm cheeses rather than soft or runny ones, but then again I've never seen a smoked Brie. Maybe I'd be a convert! My favorite cheese is Huntsman, which is basically cheddar layered with Stilton. But really I enjoy all cheeses and don't discriminate. My daughter prefers to eat parmesan–the real stuff sliced, not shredded. Which I think bodes well for her to enjoy "le Stinky Cheese" someday. Hah your niece sounds adorable! I love some good brie or Camembert but my favorite is plain old smoked Gouda. Yum!